Malaysian dancers performs at Hilton Oct. 19, 2004. When the Malaysian Tourism Board throws a party to introduce the different touring packages to their small but tropical nation they go all out with food, performances and a fashion show that showed the different eye-catching colors of this country. Part of promoting travel to Malaysia was to bring in a heavy hitter, Malaysian Tourism Minister the Honourable Datuk Dr. Leo Michael Toyad to introduce Malaysia to about 250 business people, travel related businesses, the press, and other VIP guests from other fields. Some of the guests at the event, which was hosted at the Millennium Seoul Hilton on Oct. 19, 2004 included Malaysian Ambassador to South Korea Dato' M. Santhananaban, Korea Tourism Association Chairman U. S. Chung, Mode Tour Vice President Hong Ki-Chung, Hanwha TourMall President Kim Bong-Hun. Also at the event were World Communications General Manager Nam Ki-Hwan, TFK Consulting Limited President Park Chae-Soon, and Apple Tours and Travel Service President Jon Kim. Amb. 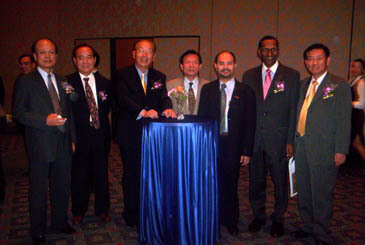 Dato' M. Santhananaban (second from right) poses with other VIP guests in "Malaysia Sales Mission 2004" event at Hilton Hotel in Seoul Oct. 19, 2004. Toyad introduced all the advantages of Malaysia to everyone attending the event and explained in great detail what his country is doing to make Malaysia a perfect vacation destination for Koreans interested in something that is "Truly Asia." "Malaysia places a very high regard on Korea, not only as a major tourist generating market, but also as an important industrial and trading partner. We are proud to be associated with Korea on many industrial ventures and we are extremely delighted to see that there is a growing interest among Koreans to spend their holidays in Malaysia, said Toyad." 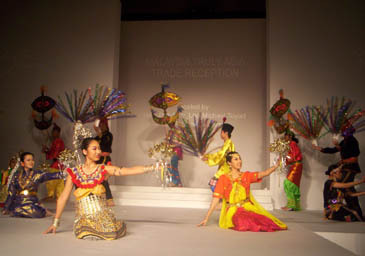 Toyad continued by saying that the Malaysian government has embarked on a large-scale promotion for tourism in Malaysia. "Malaysia is going all out in developing and promoting its tourism industry." The Malaysian delegation made sure to show all the colors and the different cultures of the Malaysian people with performances from its diverse ethnic groups. Malaysian fashion models at Hilton Oct. 19, 2004. The night's showstopper was a fashion show by Malaysian fashion designer Bill Keith (www.bilkeith.com). 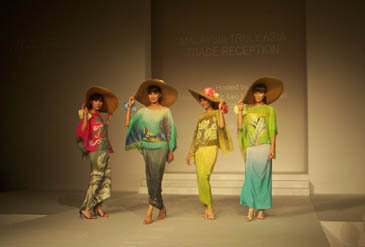 His designs were worn by models that represent the diverse ethnicities of Malaysia. Keith's designs could be described as a fusion of the familiar and the alternative, alive with tropical color yet classy and sophisticated. Everyone walked away from the evening with a smile on their faces and a new appreciation for Malaysian culture and what it has to offer in terms of tourism. One guest was heard saying before leaving the event "I have never been to Malaysia but after this show I now know that this will be my next trip." The above photos were taken by Kim Sun-Young. Yoav Cerralbo, who studied journalism at Concordia Univ. in Montreal, Quebec, serves as staff writer/editor of The Seoul Times. The 35-year-old Quebecer also writes for the Canadian Broadcasting Corp. about S. Korea. Previously, he worked on a syndicated radio travel show as a correspondent, co-host, and online editor. As a Concordia student he was the host of a comedy radio show which poked fun of everything and anything.